It is never too early to start teaching good manners to youngsters. If children have a solid foundation from the beginning, they’ll consider manners as normal behavior, notes Donna Jones, author of Taming Your Family Zoo: Six Weeks to Raising a Well-Mannered Child. When it comes to teaching manners to toddlers, follow these three c’s: consistency, caring, confidence. Toddlerhood is an age when children imitate other people’s behavior. Consistently use the words “please” and “thank you” both with your family and in public, and encourage your toddler to do the same. Don’t assume that young children aren’t watching you or don’t understand. Instead, through your own conduct, set clear expectations of polite behavior. 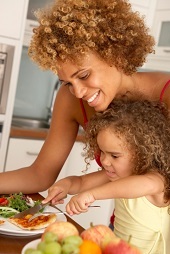 Explain to your toddler the kinds of behavior that involve manners, such as sharing, patience and listening. Ultimately, practice makes perfect, so don’t just demonstrate and discuss right from wrong. Rather, give your toddler real-life opportunities to put lessons into action. Plan play dates, trips to public places, and other activities that require your toddler to interact politely with others in real-life settings. It’s normal for children, including toddlers, to be self-centered. In discussing this on parents.com, Kathy Hirsh-Pasek, Ph.D., professor of psychology at Temple University in Philadelphia, notes that teaching manners to a child reminds the child that other people matter and deserve respect. It’s important for children to grasp this, she observes, and that manners equate to respect for themselves, for others, and for the world around them. For example, respect is why we sit at the table in a restaurant, rather than climb under it, and why we ask if we can play with a toy in another child’s house, rather than just grabbing it off the shelf. By establishing how your toddler might feel in similar situations, you help to develop empathy for other people. Once your child becomes aware of other people’s feelings, he or she is more likely to be conscious and conscientious about his or her actions. Toddlers learn from doing and seeing the results of their actions, but adults often point out the child’s negative behaviors, not their positive ones. Support your toddler’s confidence by valuing his or her good manners. Confidence comes not only from external words but also from internal feelings, so be sure to help your toddler articulate how he or she feels about himself or herself for the good choices made. Toddlers learn manners best from polite role models, age-appropriate communication and positive reinforcement. Don’t expect polite words to flow effortlessly from your child, however, especially in the throes of toddler frustration. Encourage your toddler to be mindful that polite behaviors are rewarded, and that rude actions are “against the rules” and lead to lost privileges or punishment.